Five Fans (1 x big fan: 110mm, 4 x small fans: 75mm) with Eye-catching blue LED light, optimize heat dissipation effect for 10"-15.6" Laptops (The brighter the light is, the faster the speed will be). Build with high-quality metal mesh，Mesh surface and powerful fans provide a chill mat for your laptop, Slim, portable and light weight allowing you to protect your PC wherever you go. Laptop cooling fan with built-in dual-USB hub allows for connecting more USB devices. Extra USB port and power switch design. √[5 Quiet Fans Laptop Cooler]: Five Fans (1 x big fan: 110mm, 4 x small fans: 75mm) with Eye-catching blue LED light, optimize heat dissipation effect for 10"-15.6" Laptops (The brighter the light is, the faster the speed will be). √[Ergonomic Comfort]: Doubles as an ergonomic stand with two adjustable height settings. 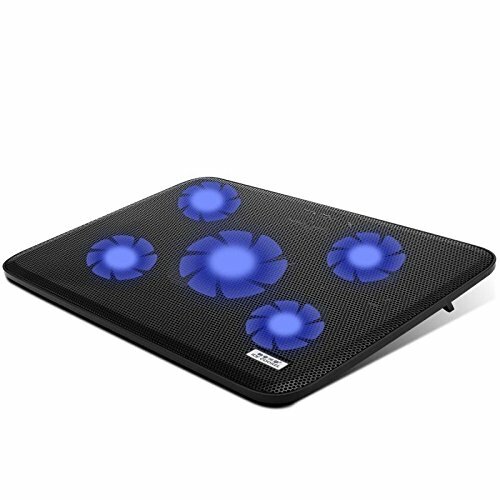 √[Ultra Portable]: Build with high-quality metal mesh，Mesh surface and powerful fans provide a chill mat for your laptop, Slim, portable and light weight allowing you to protect your PC wherever you go. √[Extra USB Ports & Switch]: Laptop cooling fan with built-in dual-USB hub allows for connecting more USB devices. Extra USB port and power switch design. √[Manufacturer Warranty]: Any question, please feel free to contact us. We stand behind all our products with 1 year warranty with actually solve your problem's 24 hours warm customer service. If you have any questions about this product by NO.17, contact us by completing and submitting the form below. If you are looking for a specif part number, please include it with your message.